Automotive industry has excelled at safety - but at what cost? If you're looking to generate headlines, there are few statements as powerful as claiming a consumer product is unsafe. From baby accessories to electricals, companies failing to meet standards have rightly been lambasted for selling dangerous goods. So when a car - something families trust to protect themselves (and these days, other road users expect to be protected from) - is given a zero-star safety rating by a voluntary organisation, having met all applicable regulatory requirements, consumers will take notice. In 2017, the Fiat Punto was reassessed and given a zero-star rating, yet when originally tested as the Grande Punto in 2005, it received five stars for occupant protection (an absolute score of 33 for offset deformable frontal and side impact), three out of five for child occupant (a rating of 35), and three out of four stars for pedestrian impact. Under the new frontal, offset and side impact tests, the same engineering scored just 19.7 points. No-one can deny that during the 12 years that basic Punto bodystyle was in production, technology advanced - but to say that a brand-new Punto sold in 2017 was a dangerous car, as implied by a zero-star rating, is disingenuous to say the least. Roll-on to December 2018 when Euro NCAP and Thatcham announced that the Fiat Panda, introduced to the UK in 2012, had also been downgraded to a zero-star rating. Unlike the Punto, this was assessed under a newer crash-test procedure introduced in 2009, and at launch the Panda was awarded a very respectable four stars. It would have achieved a full five stars, had Fiat installed side airbags and stability control on all models as standard, rather than only higher-specification versions. In response, Fiat then included ESC across the Panda range. In its 2011 test, the Panda acheived 82% adult occupant protection, at 30 points, despite being a specification without side airbags as these did not conform to Euro NCAP's fitment requirements. Likewise, safety assist did not include points for electronic stability control. Fiat even achieved an award for the Panda's safety from Euro NCAP in 2013, for the development of autonomous emergency braking or City Brake Control. This was offered as part of the Safety Pack on most Pandas for £450, and on 4x4 and Cross models for £285. In 2015 the all-wheel drive Panda Cross was assessed under the new full-width frontal and offset testing programme, and gained three stars, having achieved 70% adult occupant protection at 26.7 points. Crucially, as with the Punto, the report text states that the passenger compartment remained stable in the offset tests. Child occupant protection is rated at 77%, an improvement over the front-wheel drive Panda's 63% from 2011. For 2018, the Fiat Panda has scored just 17.4 points for adult occupant protection, or 45%. The crash test details poor protection of the chest in particular, though unchanged from the Panda Cross report. In 2011 the chest protection was considered adequate. Further contributing to the reduced score is the introduction of six- and ten-year-old dummies in the child safety assessment, in addition to child seats. 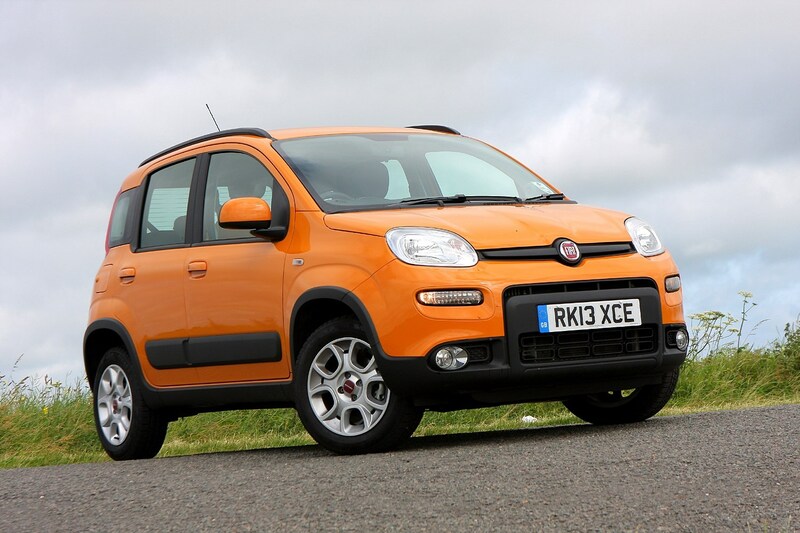 Is a Panda Cross safer than a regular Fiat Panda? Euro NCAP says it is, now. The 2015 test will not expire until 2021, whereas the 2011 test expired in 2018 triggering a new assessment. To say it's a grey area is a chronic understatement. In real terms, they offer similar passive and active safety performance, plus the enhanced grip in poor conditions provided by all-wheel drive in the Panda Cross – a factor that Euro NCAP does not take into account. Is the Euro NCAP star rating fit for purpose? As an asessment of the relative effectiveness of new car safety technology, absolutely. Comprehensive research is undertaken to ensure the benchmark keeps moving forward, encouraging wider standard fitment of autonomous and active safety features to ensure fewer avoidable accidents happen in the first place. Yet it also goes on to explain that due to the new testing standards and focus on advanced technology that 'this also means that a car which is rated poorly is not necessarily unsafe, but it is not as safe as its competitors that were rated better'. One of the biggest changes affecting crash assessment since 2015 is the frontal impact test - cars crash against a rigid barrier with full overlap at a test speed of 50km/h (31mph). Generally a full-wdth impact is easier for a car to absorb than an offset deformable crash (designed to simulate hitting another vehicle), but places greater stress on occupant protection and restraint systems. In addition, for this test a small female frontal impact dummy is seated in the front driver's seat and in the rear passenger side seat, which gives a broader assessment of varation in driver size and weight. Injuries that may have been prevented on the standard dummy can be introduced by using a different representative driver. We do need independent safety testing, and the contribution of Euro NCAP's programme to safety awareness and improvement is significant. However, a more sophisticated approach to marketing these results, including separating out crash performance and advanced technology, would seem fairest to manufacturers with budget or lighter, more efficient models in their ranges. How has a zero-rated car changed since Euro NCAP began? Below you can watch the video of the 2018 Fiat Panda. Frontal tests are carried out at 64km/h, around 40mph – roughly equivalent to a collision between two cars travelling at 50km/h, or 30mph. Wind the clock back to 1997's one-star Rover 100 rating. When tested, it was a relatively old design in most aspects. The last major revision to the body was in 1990. Nevertheless, there's absolutely no doubt as to the risk to occupants of the car in the offset crash test shown here; Rover discontinued the still-popular car soon after. Director of research at Thatcham, Matthew Avery, takes the Panda's zero-star rating very seriously, going so far as to suggest a used SEAT Ibiza may be a better purchase for a young driver than a brand-new Fiat Panda. 'Most troubling is that the FIAT Panda is seen as a good choice for young drivers and fledgling families. But the only safety technology fitted were seatbelt reminders and the rear system failed to meet requirements, so wasn't even rated. Where budgets are tight consider a safer small car second-hand, like the five-star SEAT Ibiza'. At £9,510 the base-spec Panda is not, in fact, the cheapest new car you can buy - and we would recommend looking at the Panda Easy and adding the safety pack, for just under £11,000. Most used SEAT Ibizas in the same price range will be the previous generation from 2011-onwards. 'As the bare minimum, a standard-fit Autonomous Emergency Braking system should be available with the FIAT Panda. This is especially important since the car offers so little protection in the event of a collision'. Like the Fiat Panda, the 2011 SEAT Ibiza scored 82% adult occupant protection when tested that same year. Does a Euro NCAP zero-star rating mean a car is unsafe? Historically, yes. Prior to the 2009 new scheme, if a car achieved less than three stars your chances of surviving a crash without significant or life-changing injuries were significantly reduced. Between 2009 and 2015, although the emphasis towards driver assistance gradually altered what the star ratings reflected, below three stars would still indicate poor crash protection. Bear in mind that the benchmark for five-star safety had been set in 2001 with the Renault Laguna - which achieved a score of 33 for adult occupant protection at the time. From 2018, a car which performs will in a crash test but has no safety assistants or is harder to install some child restrain systems in whill struggle to get more than one star. The star rating is still relevant, but as Euro NCAP announces the results with a graphic crash test video, it seems as though the link between crash safety, and a star rating to summarise that protection, has been lost. Euro NCAP's star rating now applies to far more than just crashworthiness. Should you change your car based on crash performance? If your car is newer than the 2009 assessment programme, and achieved a four or five star rating, there's little to suggest that it will not protect occupants well in a crash – though it will not do as much to help you avoid a crash. If you have a family, we would suggest that merely going on star ratings alone is not enough. Read our full reviews, and study the Euro NCAP reports in detail for your specific area of concern. Above all, selecting a car that is comfortable, has good visibility and secure handling in all conditions will contribute a lot more to safety than relying on emergency systems. Building cars to perform well in Euro NCAP has resulted in growth for each class – heavier, more sophisticated vehicles that use more resources, and shorter replacement cycles as buyers are assured older cars are unsafe. Should I buy a Fiat Panda? As a small, light and efficient car, there are many reasons to consider a Panda - particularly the Cross and 4x4 models. The crash performance does not appear to have changed since the car was designed, there's no suggestion that design or build flaws have been introduced to cause this low rating, so if having the latest safety assistance and kit is not as important to you as other aspects of the Fiat, there's no reason to avoid it. At the time of writing, Fiat's existing promotions running until March 2019 bring the price of a new Panda down to £7,499, or our recommended specification of Panda Easy with safety pack can be bought for less than £10,000. That's three-year old, 30,000 mile SEAT Ibiza money.